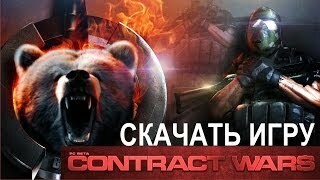 Game Contract Wars - this is a wonderful domestic massive multiplayer 3D shooter 1st person who made a multi-platform technology for Unity 3D guys from the St. Petersburg company AbsolutSoft. Contract Wars shooter game that uses business monetization model F2P. Gamers keen MMOFPS obviously be happy to play Contract Wars online, because here there are many different tactics and buildings, there is the possibility of leveling, as well as a huge selection of weapons. But first things first. Action in the game Contract Wars put developers in a fictional city Tarkov in the near future. It is here that the real war is unfolding between the two military corporations «Battle Encounter Assault Regiment» and «United security». The first of these corporations - BEAR - formed on the basis of special forces soldiers from the Russian Federation and the CIS. Second - USEC - special forces recruited from the American and European armies. As we mentioned, the game lets you do kotrakt Wars leveling. Here, everything is divided into six branches pumping on the following classes: attack, sniper, scout, destroyer, gunsmith and careerist. At the moment, this game is available on four different, social networks. You can view the information that is presented in groups. A big plus for the game is that in this project there are two types of the interface - Russian and English. In Contract Wars playing you really will be interesting, because in this game there are many famous and favorite - multiplayer mode. This game is really very, lots of weapons. There is something to shoot it for sure! Let's see what kind of game Contract Wars weapons available. We only list a few: Pistols - in the game are more than 10 species. This is a very common way sneak in the right places and easily kill enemies. Submachine guns - a mixture of a bulldog with a rhino, but it's just an incredible thing! The power of this weapon is simply amazing. There is a small disadvantage - you need to thoroughly aim before fire. But the weapon itself - simply inimitable. Shotgun - in game he's not alone. Like pistols, that there are a lot of weapons. These weapons can help you in melee. It is probably effective and can cause quite a lot of damage to enemies, but only at close range. Assault rifles - it is a weapon that is, a kind of hodgepodge that will be useful in combat. This weapon is a precision and accuracy and agility. Weapons will also often be applied by you in battle. Guns - Though they are heavy, but the queue, they are able to give, are fascinating! Beautiful and, most importantly, effective spectacle. Damage, which can inflict a machine gun - can not be compared, in fact, there is nothing! Well, finally, a few words about another weapon, which is present in this game. You can watch online video Contract Wars. This will help you finalize the decision and we are confident that this decision will be in a positive way! We wish you good luck! A little effort and you will succeed! Succeed! Victory to you! Proceed without pozheleete!